Our Gemini Pronto changeable copy sign letters are much different than our flexible type sign letters which are commonly used on portable sign units. The Pronto changeable letters contained in our changeable sign letter kits are mostly used on more permanent sign letter board systems. Pronto letters are extremely rigid and durable changeable signage products. These premium sign letters in the 3-D AD style are also guaranteed by Gemini for life! Each of the Pronto letters in our letter change sets are .080" in thickness and the clear acrylic injection molded background blanks have tiny raised edges to help prevent scratching. Our Pronto sign letters have the patented "feet" on the bottom of each letter to help prevent freezing in the lettering track like some other changeable signage will do and they are printed with UV inks. Selections below are listed by the letter size, not the panel size. 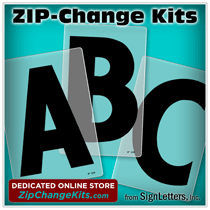 Feel free to order complete sets of our Pronto changeable copy sign letters where each standard kit will contain the most common assortment of characters with a mixture of both letters and numbers. You may also like to order individual Pronto replacement sign letters, which is available as well.